Learning the new marketing paradigm of Twitter can present a steep learning curve for many business owners. 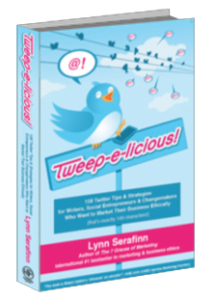 Author and ethical marketing consultant Lynn Serafinn shares ideas from her book Tweep-e-licious! that can help lighten the journey. You can find the book on Amazon.com in both paperback and Kindle HERE. For any of these strategies to work at all, your Tweets must fulfil the most important criterion of all—RELEVANCE. If your content is not relevant to your audience, it doesn’t matter what else you do. Perform due diligence in defining what kinds of people would find your work most relevant to THEIR needs, and then deliver diverse, compelling, relevant content that fulfils a variety of motivations. Combine this activity with the conscious cultivation of your partnerships and other online relationships, and with time you will see the richness of the Twitterverse emerge. The ideas in this article were adapted from the section on “Crowd Funding” in Lynn Serafinn’s new book Tweep-e-licious! 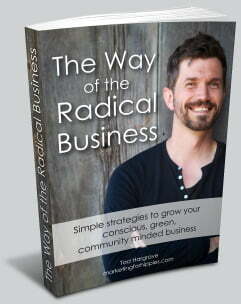 158 Twitter Tips & Strategies for Writers, Social Entrepreneurs & Changemakers Who Want to Market Their Business Ethically. Nearly 300 pages long, Tweep-e-licious is a substantive, practical manual of ethical marketing strategies for Twitter, from bare-bones basics to advanced user skills. When you buy the book, you’ll also find a “secret URL” where you can download a free 90-minute Twitter audio class plus a Twitter Resource Pack with links to over 100 useful Twitter resources. Tweep-e-licious! is available on Amazon in both Kindle and paperback. You can buy it in paperback or on Kindle. Tweep-e-licious is also available on ALL other Amazon sites throughout the world.